Australian competition law has just emerged from a significant period of reform which has seen controversial changes to the legal test to distinguish between normal competitive conduct and conduct that should be condemned. 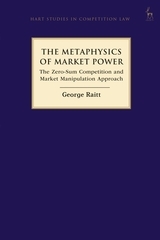 The controversy continues, arguably because the traditional legal conception of market power does not provide a useful standard in real world markets. This important new book offers a radical interpretation of market power, based on the power to manipulate. Seeing it in this way allows for positive and normative standards within which to frame a legal theory of liability for misuse of that power. The book provides suggestions to improve the forensic assessment of conduct that should be condemned as misuse of market power.